Are warmer ocean currents melting ice shelves from underneath in East Antarctica? Dr. Katherine Leonard - a researcher at the WSL Institute for Snow and Avalanche Research (SLF) in Davos, Switzerland who also holds an appointment at the University of Colorado Boulder's Cooperative Institute for Research in Environmental Sciences (CIRES) in the USA – did some investigating for the BELISSIMA (Belgian Ice Sheet – Shelf Ice Measurements in Antarctica) project to learn more. Dr. Leonard joined the 2011-2012 Belgian Antarctic Research Expedition (BELARE) based at Belgium's Princess Elisabeth Antarctica resarch station and led by International Polar Foundation president Alain Hubert to take measurements for the the BELISSIMA project, which has been investigating the interaction between the ice and the ocean in the vicinity of the King Baudoin Ice Shelf in East Antarctica since 2008. What is the BELISSIMA project about? The BELISSIMA project is trying to understand ice shelf dynamics. It’s looking at how the Antarctic Ice Sheet flows off the continent and out over the ocean at the coast in Queen Maud Land in East Antarctica. The project, which is being run by Drs. Frank Pattyn and Jean-Louis Tison at the Université Libre de Bruxelles (ULB), is looking specifically at the King Baudoin Ice Shelf, close to where the Belgium’s old King Baudoin station used to be. How did you get involved in the BELISSIMA project? I spent a couple of months with Jean-Louis Tison from the ULB on a research cruise during the International Polar Year (IPY) 2007-2008. Originally he was supposed to have made these measurements himself two years ago. But he had some instrument problems, so he couldn’t go. During the 2011-2012 season, he was scheduled to go to Scott station, so he asked me if I wanted to go to do the measurements for him, and I said yes. I’ve got plenty of oceanographic experience. My trip was funded by the Belgian Federal Science Policy (BELSPO). What research were you doing for the project? I was measuring the ocean properties at the grounding line of an ice shelf. The grounding line is where the ice flowing off the ice sheet leaves land and begins flowing out over the top of the ocean, forming an ice shelf. What is the overall purpose of the measurements you took? We’re trying to understand how the ocean is interacting with the King Baudoin Ice Shelf. We’re trying to see whether there is warm, salty water from offshore making its way underneath the ice. We want to know if there’s meltwater coming off of the ice shelf. We want to see at what depth both salty seawater water from offshore and the freshwater form the ice shelf might be. From previous radar surveys, Jean-Louis Tison and Frank Pattyn had been able to determine that there was not much melting taking place on the bottom of the ice shelf. We wanted to see whether this was true from the oceanographic measurements we took. Why were you taking measurements in this particular region? The fastest way that global climate change can influence the Antarctic Ice Sheet is through the ocean. In places where warm ocean waters are able to access grounding lines – where ice shelves meet the ice sheet – there has been quite a bit of ice loss. This has been happening a lot in the Amundsen Sea region in West Antarctica and along the Antarctic Peninsula. Ice shelves act as a sort of cork, slowing the speed at which ice flows off of glaciers from the ice sheet and out onto the sea. As ice shelves melt and lose ice, the ice draining off of the ice sheet flows faster into the ocean. As this ice melts it contributes to sea level rise. In East Antarctica, no one has found evidence of warm ocean water (warm in a relative sense, meaning between 0 and 2°C) coming into contact with the ice shelves there. However most of the ice shelves in East Antarctica are remote and very difficult to get to by ship, so no ships have been able to take measurements of the sea water next to the ice shelves there. So we’ve been taking some in-situ measurements ourselves. How did you measure the sea water underneath the ice shelves you studied? We drilled holes in the sea ice, or used leads (cracks in the sea ice) to lower instruments into the water close to the ice shelves we measured. We went early in the summer season (November-December) to take advantage of the fact that the land fast ice hadn’t yet melted much and was still stuck to the coastline of the continent, which makes things much easier logistically. Which instruments did you use? We first used an echo sounder (a device that bounces sound pulses off the sea bed) to determine how deep the water was. There had been limited surveys of that area of the coastline, so we needed to take measurements to determine how far down to lower the other instruments. Once we knew how deep the water was, we sent down a CTD (a conductivity, temperature and depth) sensor. Our instrument package also had a dissolved oxygen sensor and a turbidity sensor. All the instruments take regular measurements several times a second as you lower them into the water. So we have a very high resolution image of how all parameters change as depth increases. The instrument is able to tell the depth of the water using a very accurate pressure gauge. We lowered the instruments all the way to the sea floor each time we did a cast, so we have a complete picture of the entire water column from the sea ice to the mud at the bottom of the ocean. Why do you need to know the conductivity of the water? The conductivity of the water tells you how salty the water is (Salts are ionic compounds. When dissolved in water, they make it a good conductor). Salinity is particularly important to measure around ice shelves because water that’s just melted off of ice shelves is typically very fresh, while deeper ocean water that gets onto the continental shelf tends to be very salty. And why dissolved oxygen and turbidity? The measurements aren’t for BELISSIMA. The dissolved oxygen and turbidity have more relevance for biological processes. So biologists would be more interested in that. But since taking hyrdrogaphic measurements is logistically challenging and very expensive, and we were on the ice shelf anyway, we took measurements for the biologists as well. The measurements we took will be archived in an international database. Is this the first time you’ve been looking at these parameters in the seawater next to the ice shelf? 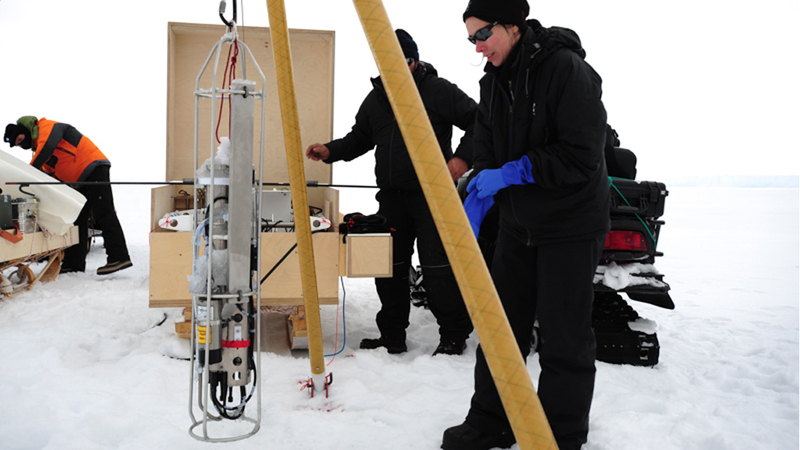 I’ve participated in expeditions where I’ve taken in-situ measurements on ice shelves. I was usually based on a ship, so I’d have to get off the ship, drill a hole in the ice, and lower the instruments into the water. This last season was the first time I’d gone out to an ice shelf from inland by skidoo. You said before that not many measurements had been taken in East Antarctica prior to the measurements you took on the coast of Queen Maud Land. Have any trends been noticed in East Antarctica? How many areas in East Antarctica have been surveyed to your knowledge? There have been one or two research cruises that travelled along the continental shelf in East Antarctica for mapping purposes. They made CDT casts fairly regularly as they made their way along the coastline. They covered a lot of area, although not with as high a resolution as we were able to do on the ice shelf. Aside form that, there have been a number of measurements made around the Fimbul Ice Shelf, which is also in Queen Maud Land, and a lot of measurements in the Weddell Sea. The area around Amery Ice Shelf in Mac Robertson Land and the region close to the Japanese Showa station have also been extensively surveyed. In West Antarctica, there has been a great deal of work in the Ross Sea and the Amundsen Sea. The George VI Ice Shelf in the Bellinghausen Sea, which is very close to the UK’s Rothera station, has also seen a lot of surveys. There’s been a lot of work on the western side of the Antarctic Peninsula, too. On the eastern side of the peninsula it’s been a bit harder to get close to the ice shelves because of difficult sea ice conditions. But there have been some efforts made in that area. Regarding the overall picture for Antarctica, is there clear evidence that a warming ocean is affecting the ice shelves in certain areas? The ocean affects ice shelves everywhere in Antarctica. However the global warming signal that is starting to appear in the oceans has not reached everywhere in Antarctica yet. The Amundsen Sea and the western side of the Antarctic Peninsula are seeing a lot more warm circumpolar deep water making its way onto the continental shelf and melting the ice from below. This is particularly true in the area around the Pine Island Glacier. Warmer water has been eroding the ice from underneath the ice shelf quite a bit at the grounding line, which has caused an intense increase in ice flow in the glacier and the region as a whole. So there has been a lot of evidence that warmer waters have been affecting ice shelves in West Antarctica. But what about in East Antarctica? In East Antarctica scientists haven’t found very much evidence of the kind of things we’re seeing with ice shelves in West Antarctica. The mixing that takes place along the continental shelf break (the far edge of the shallow continental shelf offshore, where the sea floor suddenly slopes downwards away from the continent) along the Fimbul Ice Shelf seems to be quite intense. The edge of the ice shelf is very close to the continental shelf break, so researchers expected it to be an area where warmer water from offshore would get onshore more easily. However the mixing of ocean water that takes place along the slope break is so intense that the water that gets onshore is very cold. You see the same kind of thing happening in the area around the Amery Ice Shelf. What are your objectives over the long-term? The results that we got from last season were just a singe snapshot of the conditions in front of the ice shelf. Measurements need to be taken at other points in time in order to know whether there are trends – whether what we’re seeing now is something new, or if it’s something that’s been happening for quite a while. The only way to know that is to take the same measurements in the same place at different times. Frank Pattyn will be returning to Antarctica during the 2012-2013 season to continue his work on the BELISSIMA project. Follow this season's happenings on the website of the Princess Elisabeth Antarctica research station. Dr. Katherine Leonard is a researcher at the WSL Institute for Snow and Avalanche Research (SLF) in Davos, Switzerland who also holds an appointment at the University of Colorado Boulder's Cooperative Institute for Research in Environmental Sciences (CIRES) in the USA.